You spill something on your carpet, and it leaves a stain. You clean the stain, and it disappears, but a few days later, you notice a spot on your carpet. You take a closer look, and the stain is back! What happened? How could it reappear? There are two possibilities reasons for the reappearance: soiling or wicking. Soiling occurs when residue is left behind on the carpet fibers from the carpet cleaner used to treat the original stain. If not completely rinsed and blotted, the residue becomes sticky and attracts dirt and soil to the same spot, which can cause look like the stain has returned. The other common cause of reappearing stains is something referred to as wicking. Wicking occurs when the substance that was spilled on the carpet has soaked through into the backing of the carpet (and sometimes even the underpad). When you clean the stain, you are cleaning the surface of the carpet. But then the spill that is trapped in the backing and/or underpad can be reabsorbed by the carpet and make its way up the fiber strands, back to the surface—like traveling up the wick of a candle (hence the name). Wicking typically occurs when the carpet is wet. This can happen if you have your carpet cleaned by hot water extraction (“steam cleaning”) and the carpet is damp after cleaning. This is especially a risk if you choose to steam clean your carpet yourself because many rental units are not powerful enough to extract all of the water from the fibers. 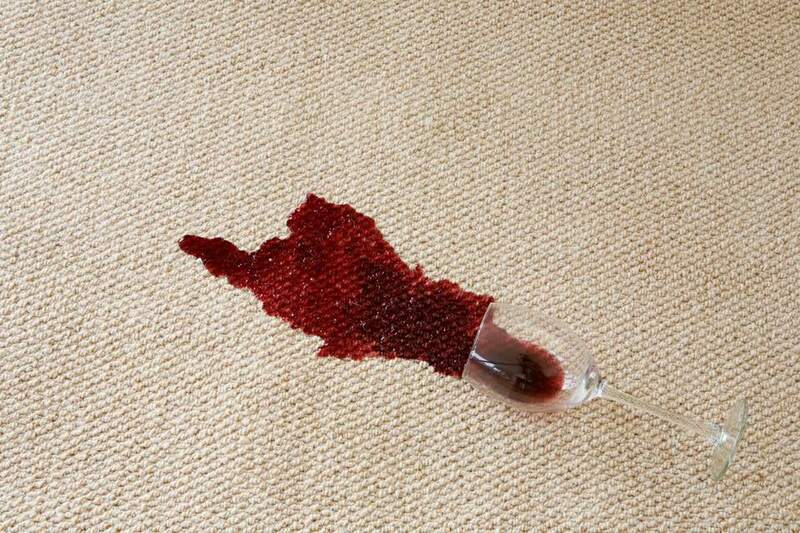 Reappearing stains can be prevented by ensuring that spills are treated as quickly as possible when they occur, in order to prevent the spill from soaking deep into the carpet. After treatment, place a stack of paper towels or a clean white towel over the spot, and use a stack of books or something heavy to weight it down. (If you are worried about your books getting wet or stained, put a piece of plastic wrap between the towel and the bottom book.) This will draw up the moisture left in the carpet. Additionally, choose a reputable professional to clean your carpet. Good professional cleaners have the proper equipment to extract the moisture from the carpet, leaving it almost dry. If you do find that your carpet is wet after cleaning, then use fans to help it dry faster before wicking can occur. So how can you get rid of the stain for good? Well, the answer depends on the size and severity of the spill as well as the cause of the reappearance—wicking or soiling. If you suspect the cause of the reappearing stain is soiling caused by residue left behind from the spot cleaner used, pour a small amount of lukewarm water on the spot. The amount of water will depend on the size of the spot, but no more than one-quarter of a cup. This will hopefully help to rinse the residue out of the fibers. Make sure to dry the fibers as much as possible to prevent wicking! Follow the above procedure by placing towels over the spot, weighted by something heavy and left overnight. If you don’t believe that the reappearance of the spot was caused by residue, then you may be dealing with wicking. Treat the spot as you normally would, and be sure to follow up with the final step of stacking towels and weights on the spot overnight. If the stain reappears again or if you are dealing with a much bigger spill, then the next step should be a professional carpet cleaning by hot water extraction. Again, be sure to choose a reputable company, and try to choose one that uses a truck-mounted unit (obviously, this is not an option if you live in an apartment or condo building). These units are more powerful than the portable ones. If the problem continues to occur, then it may be time for more drastic measures: you may need to pull back your carpet to let the pad, and possibly sub-floor, dry out. This is not too bad if your spill happens to be near a wall; obviously, it is a much bigger issue if your spill is in the middle of the room (which is, of course, where most spills happen). Once you are certain everything is dry, including the sub-floor if necessary, you can then reinstall your carpet. If you have had to pull up a large portion of your carpet, you may prefer to have a professional installer come to reinstall it to ensure a proper re-stretch of the carpet. After the carpet is installed, you can treat the stain again as you normally would. Steam Cleaning Your Carpet: Should You DIY or Hire a Pro?